, a very learned nonconformist divine, was descended from German ancestors, of whom his grandfather is said to have been the first who settled in England. He was born about 1575. 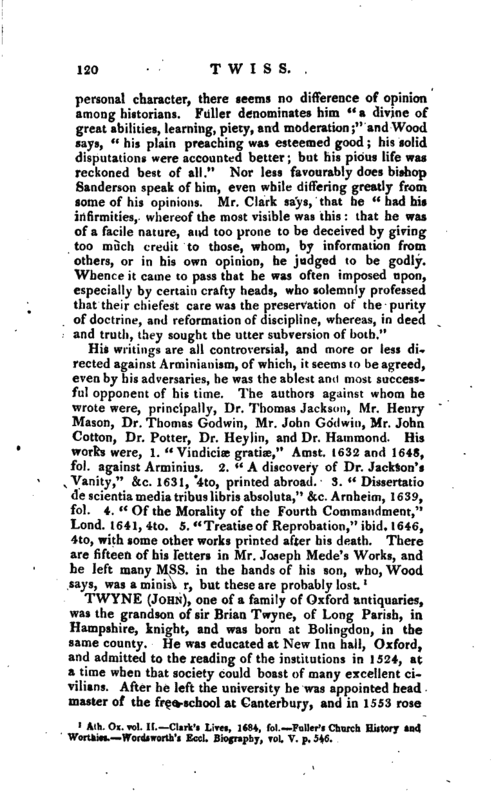 His father, who was a clothier at Newbury in Berkshire, perceiving this his sou to be weil qualified for a learned education, sent him to Winchester-school, whence he was in 1596 elected probationer fellow of New-college, Oxford, and two years after became actual fellow. According to Wood, he studied divinity for sixteen years together. In 1604 he proceeded in arts, and about that time taking orders, was a frequent and diligent preacher, “noted to the academicians for his subtile wit, exact judgment, exemplary life and conversation, and for the endowment of such qualities that were befitting men of his function.” He was not less esteemed as a logician and philosopher, and his learning appeared not only in his public lectures and disputations, but in the accuracy with which he corrected the works of the celebrated Bradwardine, published by sir Henry Savile. Besides his catechistical lectures, which he read every Thursday in term-time in the college chapel, he preached every Sunday at St. Aldate’s church; and at length his fame reaching the court, king James appointed him chaplain to his daughter Elizabeth, afterwards the unfortunate queen of Bohemia, who was then about to leave her native country and go to the Palatinate. On this he was admitted to his degree of D. D.
His stay abroad, however, was not long. In about two months he was called back to England, but on his arrival took a final leave of the court, and devoted himself to a learned retirement at Newbury, the place of his birth, of which he obtained the curacy. 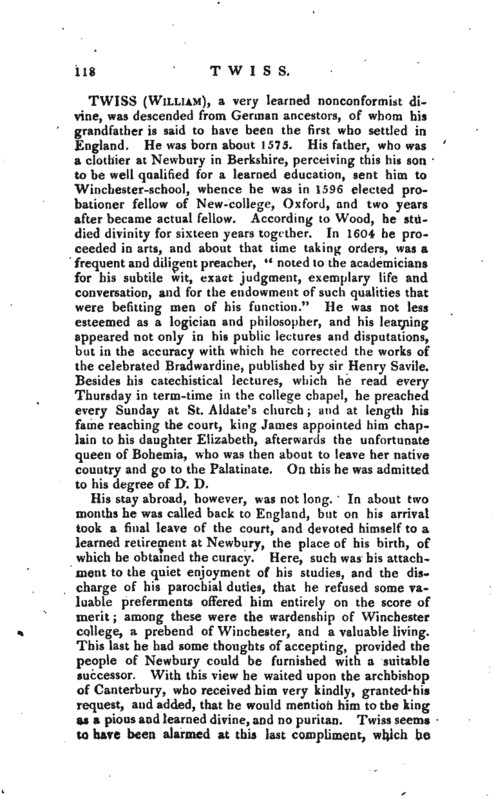 Here, such was his attachment to the quiet enjoyment of his studies, and the discharge of his parochial duties, that he refused some valuable preferments offered him entirely on the score of merit; among these were the wardenship of Winchester college, a prebend of Winchester, and a valuable living. This last he had some thoughts of accepting, provided the people of Newbury could be furnished with a suitable successor. With this view he waited upon the archbishop of Canterbury, who received him very kindly, granted his request, an’d added, that he would mention him to the king as a pious and learned divine, and no puritan. Twiss seems to have been alarmed at this last compliment, which he | knew he did not deserve, and upon more mature consideration, remained at Newbury. About the same time he refused a professor’s chair at Oxford, and another in the university of Franeker. 1 Ath. Ox. vol. If. Clark’s Lires, 1684, fol. 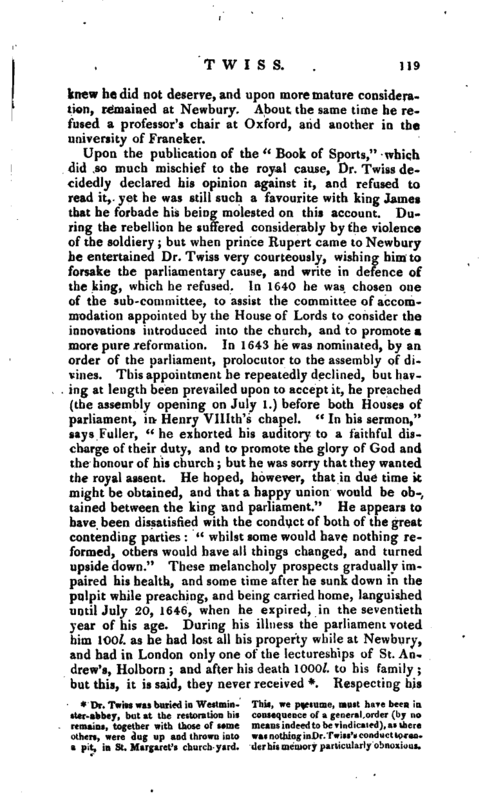 fuller’s Church History and Worthi. Wordsworth’s Eccl. Biography, vol. V. p.346.